Before discussing the "size of your glass" analogy, I want to make it clear that I'm talking about maximal relative strength - the strength relative to one's body weight. While some volleyball players need to add body mass, relative strength will always be more important than absolute strength for the majority of athletes. I would be much happier if I had a player whose squat goes from 200 to 300 pounds without a change in body weight than with a player who had to gain 50 pounds to make that jump in volleyball strength. The heavier player will have to play volleyball (play defense, approach to hit, jump to block, etc) with that extra 50 pounds. It's true that much of the extra weight will be muscle mass, but we need to be cognizant of finding the right body weight for the athlete. If you don't believe me, try strapping on a 50 pound weight vest and walking around for a day. Is the body weight you're adding functional? Probably the best way to determine if the added body weight is functional mass is to keep track of the vertical jump when gaining weight. If your vertical jump continues to improve, you're probably on track. If you gain weight and your vertical goes down, you probably need to adjust your training program or back off on the calories. For the sake of this discussion, the size or capacity of the glass is our maximal strength. 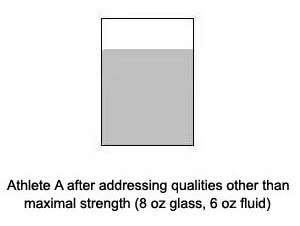 In essence, the more strength we have, the more specific physical attributes (fluids) we can put in our glass. These attributes include explosive power, strength endurance, speed, and agility - all of which can be limited by insufficient strength. 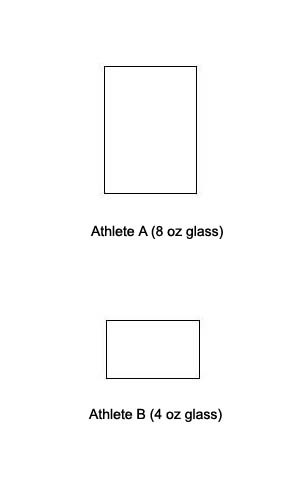 Imagine you represent two different athletes with an 8 oz glass and a 4 oz glass. 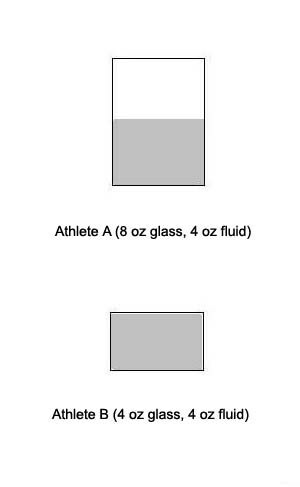 Now, let's assume that both athletes (glasses) have 4 oz of fluid (athletic ability) in them. From a performance standpoint, they may be completely equal right now. However, from a potential for physical improvement standpoint, Athlete A certainly has the upper hand. Athlete A has an advantage because she has more trainability. To improve, Athlete A needs to address the individual attributes - and most likely continue to improve the size of the glass with more maximal strength work so that she never plateaus. The sports training attributes specific to volleyball performance are explosive power, speed, agility, and to some degree, power endurance. 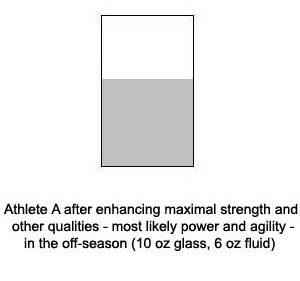 Training that addresses volleyball specific attributes will soon turn Athlete A into a "6 oz fluid in an 8 oz glass". Important Note: It's important to mention that speed/power/agility works in opposition to endurance. This is another reason I don't recommend volleyball players to perform traditional aerobic/cardio exercise such as running long distances. It's also possible for maximal strength to drop a little by focusing exclusively on other attributes that don't include maximal strength training. This is what you often see happen during the post season. 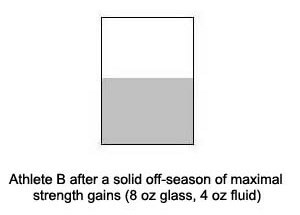 Addressing both maximal strength and volleyball specific attributes will turn her into a 6 oz fluid in a 10 oz glass. This is a much better scenario. Athlete B, on the other hand, she can't add any fluid to her glass. Her lack of maximal strength is standing in her way of her developing the qualities that will make her a more successful athlete. If she wants to get better, she needs to get stronger first - period. Let's say that Athlete B hits the weights hard and builds some maximal relative strength in her off-season. When the season rolls around, she's at an 8 oz glass and has managed to maintain her 4 oz fluid (yes, it's possible; maximal strength is that important). Athlete B is now poised to take advantage of this newfound strength as she applies it in volleyball-specific contexts in the new season at hand. Her agility, speed, and power will go through the roof. Important Note: If you're young, it's especially important to focus on getting stronger. Generally, most volleyball coaches don't consider strength as a very important factor in improving volleyball performance. This is a mistake. Especially in youth volleyball, improving strength will dramatically improve every part of the game (serving, spiking, passing, setting, blocking, etc). So you think you're strong? Here's a demonstration of a female athlete performing chin-ups with 45 pounds of extra weight. Just by making your glass bigger (enhancing you maximal relative strength), you will further broaden your foundation for improvements in all these other realms. Sure, you can include some plyometric and agility exercises in your volleyball training program. But you see, maximal relative strength has a "trickle-down" effect to all things athletic. If you took your best squat from 150 pounds to 300 pounds, a single body weight squat would feel a lot easier, wouldn't it? How about a single vertical jump? You have about 0.2 seconds to exert force on a classic vertical jump test. You'll never make use of all the strength that you have, regardless of how good your rate of force development (explosive strength) is. However, let's say that you can put 50% of your maximal strength to work in that short time period. If we keep that percentage constant, isn't an athlete with more maximal strength automatically at a great advantage? The 150-pound squatter can exert 75 pounds of force into the ground. The 300-pound squatter can exert 150 pounds! Is there really any question as to who can jump higher? Building more maximal strength is not going to hurt you. Anyone who tells you that being strong will make you slower is flat-out wrong. As long as you're not training with super-slow tempos and your body weight isn't increasing out of proportion to those strength gains, you'll get faster - a lot faster.